Pontos Requerido: 2800 Os jogos não são compatíveis com dispositivos móveis e tablets. Por favor adicione este título à sua Lista de Desejos e inicie a sessão na sua conta the first club desde um computador para concluir o processo de solicitação. NOTICE: Activation key must be used on a valid Steam account, requires internet connection. ABOUT THE GAME	Set in a fantastic 1930s world, “Impossible Creatures” is a 3-D, real-time strategy game by Relic Entertainment the creators of Homeworld, Dawn of War and Company of Heroes that pits the player against an evil villain in a desperate campaign across a chain of remote and diverse … islands. Using Earth’s most formidable animals as building blocks, the player must create an army of genetically-altered mutant monsters in a titanic struggle to protect an unsuspecting world.KEY FEATURESSteam Edition Features: Fully remastered to work with modern systems	Insect Invasion, Mod SDK (C++) and all patches included Re-implemented multiplayer and NAT traversal for a smooth online experience Steam Friend invite implemented Steam cloud support Key Features: Thousands of units: “Impossible Creatures” has more than 50 animals that can be combined to create a vast number of mutant creatures, the results of which are limited only by players’ creativity. Strategies as boundless as your imagination - By building these creatures into powerful and effective armies, players can define their strategy and how they want to tackle their opponents. Explore rich 3-D worlds – The highly detailed, fully 3-D dynamic world allows players to battle in four richly detailed environments, each with special flora and fauna. Compelling single-player campaigns – Players command dozens of creatures, and henchmen in 15 missions across 14 distinct islands. 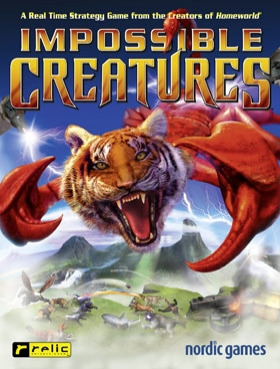 Unprecedented replayability – “Impossible Creatures” offers boundless creature combinations, armies, and strategies as well as online play and an easy-to-use mission editor that provides limitless play options. Unique multiplayer options – Up to six “Impossible Creatures” players will be able to wage war in real time. The multiplayer component will streamline base-building, allowing players to build creatures offline and store them for future online battles. Transferable units – Players can refine their armies in the single-player campaign, and test their strategies with the same armies in a multiplayer game. SYSTEM REQUIREMENTS Minimum: Operating Sytem: Windows 98 / ME / 2000 / XP / Vista / 7 / 8 / 10 32 or 64 bit Processor: 1 GHz Memory: 512 MB of memory Graphics: DirectX compatible video card with 64 MB VRAM DirectX: Version 9.0c Disk Space: 2 GB available disk space Sound Card: DirectX compatible Sound card	Recommended: Operating Sytem: Windows XP / Vista / 7 / 8 /10 32 or 64 bit Processor: 2 GHz Memory: 1 GB of memory Graphics: DirectX compatible video card with 128 MB VRAM DirectX: Version 9.0c Disk Space: 2 GB available disk space Sound Card: DirectX compatible Sound card	© 2015 by Nordic Games Licensing AB, Sweden. Licensed exclusively to Nordic Games GmbH, Austria. Developed by Relic Entertainment. Impossible Creatures and THQ are trademarks of Nordic Games. All rights reserved. All other trademarks, logos and copyrights are property of their respective owners.